Review: Jones is a young doctor with amazing neuro-surgeon abilities. But when he is unable to help his fiance at the scene of an accident, Jones is shaken to the core and leaves surgery in favor of teaching in a medical school. When Lara Blair, the owner of biomedical engineering company comes calling on his door to help develop a robotic surgical tool that goes deep into the brain his immediate reaction is thank you but no. But Lara is a determined young woman for urgent reasons way beyond the thrill of invention and money. As their friendship develops Jones must push beyond his fears and find the courage to re-enter the surgical suite as more than a teacher. While a little slow moving for me in a few places this was a wonderful story of love and pain, the courage to move beyond and of recognizing God's gifting in your life. The research on robotic surgery really showed but was placed into the story in a very easily readable, and definitely not dry, way. Lara and Jones relationship was very interesting as it developed beyond the pursuit of business. Review: Max and Jade's story continues as Max returns from rehab. With much to make amends for, he and Jade start to try to rebuild their family which now includes Max's son whom Jade as been raising as her own while Max was at rehab. Their story was believable as they try to work out the difficulties of trust issues that come with addiction, and as they face secrets again trying to come into their lives and blow them apart, even while trying to know and follow where they feel is God leading them. It was easy to cheer for them and feel happy for their triumphs even while feeling your heart sink with their trials and mistakes. This was one of those stories that didn't mince on difficulties but at the same time left the reader feeling uplifted. Definite thumbs up in my opinion. Review: Truman Wiley is a character you love to hate. He's got issues and plenty of them. Having lost his high profile job with a news network, he is now estranged from his family, has a major gambling habit, is in debt and running from a loan shark, has lost his car and the cabin he was living in. 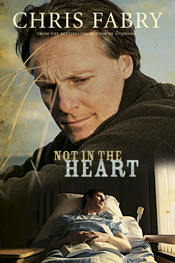 He is sarcastic, a dead beat dad and a missing in action husband who has not been there for his wife. And his son is dying. He is at the end of his rope when an opportunity to write the story of a man on death row comes his way. Conley was convicted of murder and is set to face death in one month. Always maintaining his innocence and having had a prison conversion to Christianity, he has given up hope of having his sentence over-turned and wants to have something good come out of the situation. He wants to donate his heart to a dying teen. A dying teen who happens to be Truman's own son. Truman reluctantly takes the job, not thrilled that anything to do with Christianity is involved, but the family also happens to go to his wife's church. And he desperately needs the money. As he starts looking into the death of the murdered hair dresser, he starts to come across evidence that could mean Conley has been telling the truth all along. But telling the truth would mean that in all likelyhood his son will die. I thought this was an great, albiet heavy, read, one that brings you face to face with how you think and feel about some tough subjects. I felt Fabry handled the personality of an addict very well. While I have not had experience with a gambling addict, I have known and had to deal with a drug addict. Totally narcissistic, running from all responsibility, all their decisions, even to the detriment of all their relationships, being made through the lens of their addiction was told in a very realistic way. I thought the relationships between Truman, his wife and his children's viewpoints was told seamlessly as it went back and forth between them. Yes, the personality made me mad but that is the nature of an addicted person. Conley as the convicted murderer who maintains his innocence but is resolved with the fact he is going to die, also brings in the issues of capital punishment and of organ donation. The author, through the story, shows the great need out there for organ donation and asks us how far are we willing to go with it? The controversy of organ donation by death row prisoners is brought to the forefront and raises many questions. Is it ethical? Do people want the organs of who they might feel are "evil" and "bad". Will more prisoners be killed quicker on death row just so their organs can be harvested for transplants? All these questions and more are looked at through the story and makes you think where your stand is on very hot button issues. The main character also wrestles with the fact that he may have evidence that in the very least would throw doubt onto the prisoner's conviction and that the revealing of it will remove all chances for his son and mean his death. 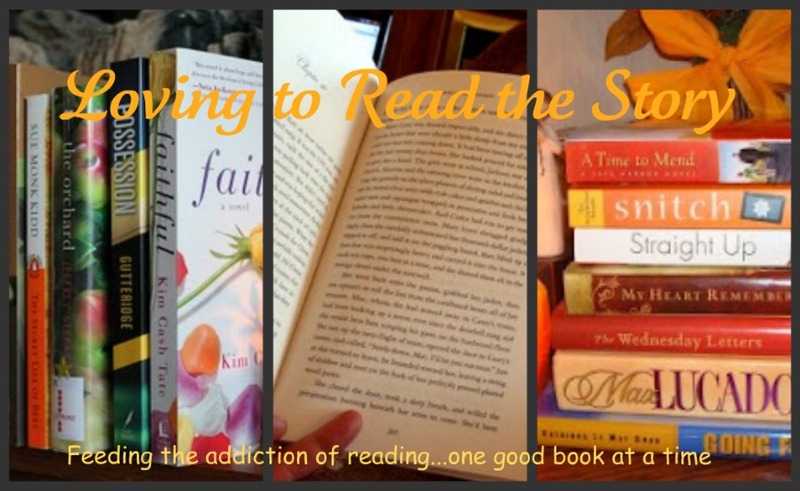 As a reader, I was faced with how I view other's shortcomings and failures as well as my own. Is there a place for second chances even in the most dire of circumstances? 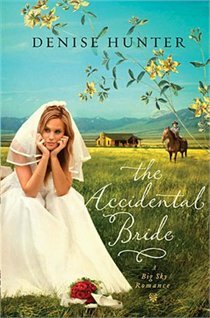 Review: After being persuaded to be the bride at her town's Founder's Day celebrations, Shay is shocked to see that the "groom" waiting at the top of the aisle is non other than Travis, her first love, and the man that left her on the courthouse steps 14 years earlier to pursue his rodeo dreams. Using the premise of a couple becoming accidentally married in reality when all they were doing was a reenactment of a historical event, the author explores topics such as forgiveness, trust and worrying about what others think. It is a romance story so there is a very strong romantic element. I enjoyed the storyline of Travis trying win back Shay's heart. In turn, I thought the story of Shay's feelings and struggle in believing and trusting Travis, even with his most honorable intentions, after being abandoned both by him and her husband in her past was believable and well written. Throw in her childhood poverty, her desperation at losing her ranch and her desire to do the best by her young daughter and I could certainly see where she was coming from. Because it is a romance novel, there are parts where the two run into situations where they're attraction to each other takes over. While the feelings are described, a few of which while coming close, did not cross my personal lines, but do get intense and did make me consider whether I would want my teenager to read. And because I am reviewing with my personal Christian convictions, there is an element regarding that within the story that made me a bit uncomfortable. ( I don't know how else to say it without telling a part of the story). All in all, it was a good weekend read for those who enjoy a romance novel that has some exploration of issues we all go through thrown in. Review: In 1969, Rebecca's family moved to Sellerstown, North Carolina. Rebecca was just a pre-schooler when her father felt the call of God to pastor a small church in this small farming community. They were welcomed openly and as the small congregation grew all who attended respected and loved Pastor Robert, his wife Ramona and Rebecca. All except one man who attended the church but was not actually a member. Being wealthy and having a strong control over the people of the town, he was not pleased when decisions in the church started to not go his way. Over the next five years, this "upstanding" member of the town unleashed an attack that is almost indescribable against Rebecca's family in order to drive them from the town. The Nichol's family lived under constant harassment, threats, shootings and even dynamite bombings for 5 years planned methodically to scare them away. Rebecca never knew a time in her childhood when she wasn't afraid. Then an event occured that changed Rebecca's life forever. He and Ramona instilled deep into Rebecca's heart that forgiveness, for the Christian, was a way of life and not an option. This story touched me deeply. We are studying offense and forgiveness in my ladies study group (see book in my sidebar) so the timing of this book coming into my hands could only be from God. It lined up perfectly. In our discussions on forgiveness us ladies at the group go through a whole lot of "ya but's". This story is the testimony of someone who actually walked out that forgiveness that we are with such difficulty trying to wrap our heads around. While most of my reviews, unless a book tour review, are being done on my book blog, I felt I had to review this one here so more people would know of it. I will not lie, this book was in places grievous to read. It broke my heart what this family went through. What a person out of rage and jealousy can perpetrate upon others is unbelievable. There were several times when I just cried for them and my heart literally felt heavy. But it is also a story of redemption, of faith, of hope and of the power of God's grace to forgive the actions of even your worst enemy. Rebecca's last chapter teaching on forgiveness is biblically solid and her story shows it is possible, that God doesn't ask us to do something He will not give us the grace and strength to carry out. I would say this book has had a profound effect on me and has faced me square on with the "ya-but's" excuses in my life. Unforgiveness is rampant in society and causes a myriad of problems in people's lives. It can be passed down in families and amongst friends. It puts us into chains and takes us captive and puts us into a chokehold that God never meant for us to live with. This story shows that forgiveness can profoundly effect us, whether we are the forgiver or the one being forgiven. I borrowed it from the library, but I will be buying my own copy so my kids (17, 20 & 22) can read it and so that I can lend it out to those struggling with forgiving others. I highly, highly recommend this read. Review: Kate Winters is a young lady from a fairly well off family in 1855 Westerville, Ohio. She is one of a very small group of young ladies who are the first women to attend Otterbein College and with graduating comes the first step towards her secret dreams of leaving Westerville before the family secrets and her Mother's controlling suffocate her. But she is hindered from achieving that dream when, because of her painful shyness, she is not able to complete an assignment that requires she make a speech in front of the class. At her Mother's insistence she tries out for a musicale being done at the college, her mother hoping she gets over her shyness and Kate in the hopes that she can use it to make an escape and run away from home & her Mother's schemes to marry her off to a wealthy young man who also attends the college. When Ben Hanby hears Kate sing, though she is quiet and shy, he is taken with her voice and quiet demeanor. He immediately wants to cast her for the solo in the musicale. As Ben starts to develop feelings beyond the musicale for Kate he is torn because of his own secrets that he must keep as his faith leads him to work alongside his parents for the Underground Railroad. While on a "railroad business" trip that coincides with a shopping trip that his mother is making that includes Kate, Ben and Kate are unexpectedly thrown together into circumstances that goes beyond the musicale and brings their hearts together in a way neither could have imagined. "The equestriennes vaulted from one horse's back to another, changing places with astonishing precision. A clergyman had endorsed this act, with women in their knee-length tutus and exposed legs in tights? It was no different from the ballet, she supposed. Nonetheless, she sensed Ben's shyness from the determined set of his head, as if he dared not even glance at any of his lady companions while such a display of limbs occurred--not just ankles, but entire calves, practically even knees when the tutus bounced. " "The air shimmered with the heat of the woodstove down by the door, but here in the middle of the car, Ben had to pull his muffler closer to his neck against the cold. Woodstoves could not combat the drafts from the windows of a wooden box on wheels, speeding across the landscape at twenty miles per hour." The contrast to today's world is made so well by the descriptions of the decorum and transportation of the time it made me smile. But the story also told of the heartache of the slaves and their flights to freedom and of the deep convictions of those helping them. It was beautifully written and conveyed their deep convictions and courage. I would love to get ahold of the first book in the series which centers around the parents of Ben Hanby and their work. I would definitely recommend this read for historical fiction fans, clean love story fans and/or those interested in the history of the Underground Railroad. 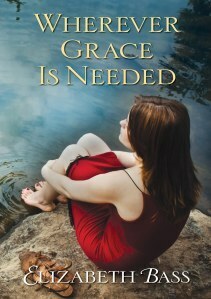 Review: Grace Graham is a young single mother who has spent her life running from the tough situations in her life. She has just broken up with her fiance so when her sister phones and basically demands she come home to help care for their father who is having knee replacement surgery, Grace reluctantly agrees. Now she must face her anger at her father, whom she blames for her mother's death. And all she wants to do is turn around and run. But her four year old son is thrilled to meet his baby cousin for the first time so she tries to stick it out as best as she can. But when Dylan starts to get ill, and it turns out the illness is a direct result of decisions she had made in the past all she wants to do us run again. And now her decision has not only affected her and her son but many families within the community. But she has nowhere left to run. She must find the courage and strength to stay and face what happens and grab the second and last chance she has been given to make things right. I could not put this book down and read it within a day. That is unusual for me but it was easy reading that just drew me right in and didn't let go until the very end. The author, in my opinion, presented really well the arguments for and against immunizations. And in the context of this debate she tells a wonderful story of coming full circle, second chances and doing the right thing in spite of our fears. I was drawn in by all the characters, everyone of them was interesting to me. The situation was complex and unthinkable and their emotions and reactions were very real and raw. It had my heart gripped. An excellent read! Review: With each chapter taking on a different issue that can harm marriages, the author gives a small biblical teaching on each topic and then teaches you how to pray for it. I liked how she approached some difficult topics and always looked at them through the lens of hope. I liked the format of tackling each topic separately and how the prayer sections at the end of each chapter were set up: Prayer for Protection, Prayer for Breakthrough in Me, and, Prayer for Breakthrough in My Spouse. A really powerful little reference book chockfull of scripture. Review: Tucker Mason didn't have an easy childhood. Raised without a mother and with an alcoholic father who wanted basically nothing to do with him and his brother, Tucker received his moments of love and happiness not from his father but from spending time with his brother and young friend, Katie and from the black woman his father hired to take care of them. Tucker is now a world famous photographer whose work has graced the covers of the most famous magazines and newspapers. As he heads home after a shoot in Florida, he comes across a young woman and her son who are on the run and who obviously need help. Then when the news comes that his brother has escaped from a mental facility, Tucker is forced to face his own ways of running. Running from a horrid childhood. Running from the hate that would consume him. But the one thing he can't run from is the love and influence of Miss Ella, who raised him and his brother as if they were her own. Though she passed away several years ago, her words are still rising up to influence and guide him to break the cycle of anger and let love win, but will he listen? This is one of the best books I've read in a long time. It's compelling and haunting. A story of good vs evil. Of love and redemption. Of influence in a child's life. The writing is more sophisticated, for lack of a better word, than a lot of the books I've read of late. It took me a little while to get used to the flow of it. The descriptions at first seemed a bit much for my liking but it all came together as the story went on to the point it was hard to put the book down. The author wove the story with such skill that every emotion of the characters was felt deeply as I read. Each main character was developed so well that you felt you knew them. The last quarter of the book I basically cried through as Tucker and his brother, Mutt, had to come to the place of dealing with what they had seen and experienced as children. I'll not lie, reading parts of this story was very difficult but I don't think the author dragged those out. He kept the focus of the characters who put their hearts to do good. My heart broke for both the brothers but mostly for Mutt who was dealing with mental illness. I thought the author took us to an understanding of mental illness that fiction novels usually don't. The character of Miss Ella, who raised Tucker and Mutt as though they were her own children, and who consistency and with love and a deep faith, built them up even as their father tore them down, even as she, herself, suffered was compelling and inspirational. And reading the author's notes on his own memories of a praying mother made me long for my own children to have those kinds of memories of me. This is one of those stories that you think on for a long time after you turn the last page. An absolute must read in my opinion. Would make a great reading group choice in spite of the fact that it does not have a reading group discussion guide at the back. Review: Rose, Bianca and Cordy, three grown sisters, all find themselves back at home in their parents house when their mother is diagnosed with breast cancer. They come to help but they also come for their own secret reasons, the likes of which they don't want anyone, not even their sisters to find out. It isn't long before the family dysfunction starts to surface and overtake the reunion, and they fall back into their old patterns of sibling roles. Rose the strong, take charge oldest sibling. Bianca, the feeling like a nobody, has to prove herself middle sister, and Cordy the spoiled, responsibility shirking, princess of the family. But as adults it all starts to blow apart as the crisis makes each sister take a good hard look at their own lives and changes they might need to make. This book left me with mixed feelings. The good stuff: I thought the approach of writing parts of the story from a narrated point of view of the sisters as a group was unique. It added a different flavor to the writing. The story was compelling and heartfelt and you just wanted to keep reading to find out what would happen with each character, to see if they would be able to get over themselves long enough to really help their mom. Each character was well thought out and written, exploring the relationship between sisters and birth order. I, of course, related most to the oldest sister, and saw parts of myself, in her character. The father, an intellectual and a professor of Shakespeare, and the way he related to his children and it's effect on their lives, was also explored on a lesser level. The writer drew you into their lives, the good and the bad, right from the beginning. While the issues and problems were forefront for most of the book, the ending left me feeling you could cheer them on to the places in their lives they were going. And while two of the sisters had no problem with "free love" and it was a huge part of the story of their lives, I thought the author was, thankfully on my part, not overly descriptive. I knew this book would not be presenting a Christian world view, so I was not expecting it to be clean cut, but it was a nice surprise to find the author handled this area in a way that didn't make my hair curl. The stuff I didn't enjoy so much: While the lifestyles and secrets each sister held started off as interesting, by 3/4 of the way through, I was tiring of their immaturity, selfishness and self absorption. The way they acted reminded me at times more of teenagers than of adults. The way the father interacted with them, while unusual, left me wanting to shake him. About midway through the book the "f bombs" started to fall and continued occasionally until the end. I thought there could have been more of a look into the influence of the mom in the story. In spite of these things, though, the book did really hold my interest as I held out hope that something would change in this dysfunctional family and their personalities and relationships would mature, grow and mend. Review: I was first drawn to this book because my son is studying to be a paramedic and the back cover sounded interesting. However, after the second chapter I closed the covers and set it aside due to the prolific use of expletives. Just didn't want to deal with that. The story is not worth the wading through constant f-bombs, taking the Lord's name in vain and various other swears. Not worth my time. I know in the book above I mentioned there were f-bombs but they were few and far between compared to this novel and the Lord's name was not used as a swear. This was over my imaginary line. Review: In this book Sheila Walsh, coming from her own places of brokeness and pain, tries to help us deal with the pain and suffering we may be experiencing in our own lives and points us ultimately to Jesus to open doors of deeper intimacy with Him. I was looking forward to reading this book by Sheila Walsh. I've known of her background from singer to tv host to admittance to a psychiatric ward for severe depression to speaker at Women of Faith conferences. So I knew she would be coming from a very personal place in writing this book. And she does write honestly about her places of brokeness and the things that she still struggles with today. This was however, a book I found very hard to get into and to finish. It felt disjointed to me and I had to really focus and plug away at it. She tends to quote a lot of other people all through out the book which I don't like because to me personally, it breaks the flow of the author's voice. And she tells a lot of other people's stories along with her own. I also didn't quite know what to make of the chapter comparing some grace to what she calls "Halloween" grace. I hated that term and comparison. In glancing back through the book to write my review, I can see however, there were a couple chapters that I did get lots out of as evidenced by the heavy doses of underlining and writing in the edges in those chapters as compared to the other ones. But all in all, this was a book that was, for me, more of a picking up nuggets type of a read. There is an indepth study in the back but in all honesty, I only glanced at it. Review: Mitzi Steiner was once a celebrated half of a singing duo with her husband Gabe. 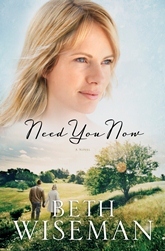 Now in her eighties, Mitzi divides her time in between volunteering at the local hospital and spending time and ministering to her now bed ridden and unaware Alzheimer's stricken beloved husband. Brooke Woodson's life seems to be finally on track. She has a great job as a paralegal and seems to have snagged the most wanted ambitious bachelor in town. But after their engagement, a side of her fiance starts to surface that Brooke never could have imagined. As his anger spins out of control, Brooke is under pressure to hide the real man from her Mom, family and work colleagues, all at risk to herself. When Mitzi and Brooke's paths cross in the hospital, Mitzi immediately recognizes what Brooke's accidents really are and takes a step of faith and offers Brooke shelter and a safe place to recover. Not knowing why Brooke accepts and the start of their unlikely friendship starts. During her stay with Mitzi Brooke learns of Mitzi's own difficult past and understands why Mitzi so wants to help her. The story telling talents of author, Carla Stewart, really shine through as she weaves the stories of Mitzi's past and present and Brooke's difficult life into a story that really pulls out every emotion in the reader. I cried, I felt uplifted, I felt the pain and the anxiety the story tells. I cheered on Brooke as she admitted and faced what she had to, felt compassion for Mitzi as she tenderly cared for husband, was drawn into the story of Mitzi's past. Each main character was well written and I really cared about the characters as the story made it's way to the end. How the author wove such a great story together while dealing with such difficult issues as abuse and Alzheimer's in a compassionate way and still maintaining a story that flowed and didn't get bogged down gives credit to her wonderful story telling. A wonderful read if you like a book that makes you care. Review: We did this book as a study book at my ladies bible study and I don't think any of us were truly prepared for the depth of study and the challenge this book would present to our Christian walk. The author takes the reader through step by step, into a study of how satan uses offense and bitterness to entangle and snare a believer, how God feels about it, and then he teaches the reader how to get free. It is deep and it is challenging. It makes you search your heart, it makes you get face to face with issues and excuses, and it brings you before the Lord. Parts of it are not easy. The study at the back asks guide the reader through specific thoughts and questions to pinpoint where you are with offense in your life and then shows scripturally how God looks at it and how we are to deal with it. At the end, I was left with a better understanding of offense and what it does in a Christian's walk and relationship with God and I am now much more of aware of my "red flags" that tell me when I am allowing offense in. Well worth the study and it's a keeper on my bookshelf. I'm sure I'll be referring to various chapters and rereading this one! Review: Max Lucado takes on a journey following the last week of Jesus' life here on earth. He explores what was most important to Jesus in the things He did and spoke when He knew His life was coming to an end. I picked up this book because I wanted to read something before Easter that spoke to my heart about what we are observing and celebrating as Christians in this season. I'd never thought about when someone knows they are dying that the last words they speak and the last actions they do are what is most important to them. I thought it was a beautiful perspective that Max Lucado showed. Some chapters really spoke to my heart and were easy to grab ahold of and connect with. Others were a little bit more of a struggle as I tried to get past the writing style to find what the author was really trying to say. But all in all, it was the perfect book to read over Lent and prepare my heart for Easter. Review: After all the years of watching the Anne of Green Gables series, I decided it's about time I read the book. And it did not disappoint. I loved the written original, laughing at Anne's antics just as much if not more as I read the story. For some reason I thought the writing would somehow be bogged down and "old", but it wasn't at all. It was fun and easily read and the pace moved along. The only reason I didn't give this amazing classic a 10 was because it did slow down a bit in the section where Anne went to Queen's. It seemed to skim the surface of her experience and go quickly to get through the school year. Other than that, I want to buy this book! Loved it. 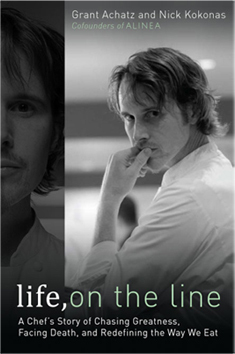 Review: "life, on the line" is the story of Chef and co-founder of Alinea, a restaurant that is ranked in the top 10 of the world. From his humble beginnings cracking eggs with his grandmother in the family owned diner at the age of 5 to his journey to becoming named Best New Chef, Rising Star Chef of America and Best Restaurant in America, this was an interesting read. You follow Achatz through his strained childhood with an alcoholic father who came in and out of his life to his time at the Culinary Institute of America to his working for his mentor, Thomas Keller at the French Laundry, (another top restaurant), to his meeting with his friend and business partner Nick and the founding of Alinea. It's a story of a very driven, very creative young man. The reader is taken into a journey of his philosophy of food, that of food not only involving the sensory of taste but of evoking emotion as well, of food as art, food as entertainment. The storytelling was interesting and I never found it dry, not even when there was lots of pages of descriptions of the restaurant coming together. In fact it was a story hard to put down. Once Achatz meets his business partner, the story starts to go back and forth between the two of them and brings both of their perspectives into view. But this isn't just another story of another world class chef and the building of a world renown restaurant. What was really unique about this story and what really brings the title of the book into a whole other meaning is that right when Achatz realizes his culinary dreams he starts to get sick. He is diagnosed with stage IV squamous cell carcinoma or tongue cancer. Doctors don't give him much hope and the treatment of the day would radically alter his appearance, his speech, his life, his career and his quality of life as they would remove his tongue, cut his jaw and into neck. Without this "treatment" he basically has a few painful months to live. As he deals with the most horrendous news a chef and a person could receive by turning to the safety net of his work, his friend and business partner deals with the news by searching the internet constantly for alternative treatments. He found one that involved very aggressive chemo with a different drug and then a schedule of twice a day radiation that takes the patient as low as they can go and then removal of the lymph nodes of the neck. Achatz decides to try for the alternative treatment but pays the price of losing his sense of taste. But he kept at his life's work and has gone on to open yet another innovative restaurant and win the James Beard Foundation Outstanding Chef in America Award. I like autobiographies because I like to see what makes people tick. I wouldn't call myself a foodie but I do love watching the food network. I've always wondered what makes these chefs so driven, so willing to work so hard at their craft with what sounds like not much pay, and why sometimes they are so egotistical. When I saw the book at the library I was drawn right to it. It's not just a story of a very creative person or of food or the ego or the drive. It's a story of surviving cancer and of friendship. I really, really enjoyed the whole of this chef's story. I do feel that I should warn there is some foul language scattered here and there. There are several f-bombs dropped. There is a couple instances of the Lord's name being taken in vain, which to me is the worst swear. On the whole the swearing is much less than what I thought would appear in a book written by a chef considering the amount of swearing there is on some of the shows on the food network. I was totally prepared to put the book down as I have done before when the swearing is pervasive, and though I would MUCH prefer that there be no swearing whatsoever, I know that is probably unrealistic in a book of this sort. Review: When the opportunity to move their family to a small rural town presents itself, Brad and Darlene take it in the hopes that it will help their oldest son who was starting to get in with the wrong crowd in the big city. But coping with the move has been hardest on their middle child and in an effort to keep living up to being the perfect child and not rock the boat, Grace is dealing with her pain in her own way, by cutting herself. Darlene thinking her family is going along just fine, starts a job outside of the home but when things start to unravel bringing turmoil not only into the family unit as a whole but into what she thought was a rock solid marriage, Darlene is faced with temptations of her own. 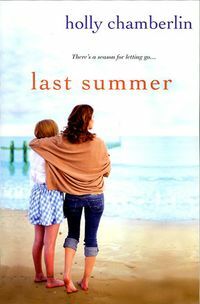 This was my first Beth Wiseman book and I enjoyed it. 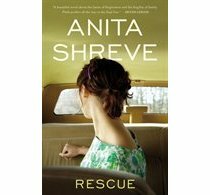 While up until now she has written Amish fiction, this book was a contemporary story about a family in crisis. The base premise of the story was really good... who do you turn to when everything in your world is falling down around you? When even God seems far away? When confusion and fear starts to color all your perspective and decision making process? There was lots of tough issues tackled in this book, some really well and some only touched upon. Because it is a book about a family, there is five characters each dealing with something in their own individual lives and yet affecting the family unit as a whole. Throw in a handful of secondary characters and that is a lot of issue and character juggling. But I thought the author chose which of the issues should come to the forefront and carried it through to the end of the story. I'm actually hoping that there is a second book in the works so that those issues and characters that were pushed to the background can be explored. I was very curious how the author would delve into the huge issue of teenage cutting as my daughter used to have a friend who was battling this. And it is scary! I was afraid that the issue would be over simplified with simple, wrapped up in a bow solutions because in real life it is not. The author, I thought, did as good a job as one can do within a novel of normal length. The story gave me a better understanding of the struggle faced by these kids who cut. All in all I enjoyed this modern story of the trials and struggles of a Christian mom who finds herself confronted with what she really believes. Review: Ten years ago Kendall, Mallory, Faye and Tanya were aspiring writers who met at a conference and formed a strong bond and friendship. Mallory became a best-selling author pumping out book after book, Faye, married to an internationally known televangelist, found her niche in the inspirational fiction market, Tanya in the romance genre. Kendall, in spite of all her efforts remained an author in the middle of the pack and has been experiencing failing sales. When Kendall's career and her personal life starts to unravel and she hits bottom, her four friends rush to her side at her mountain home to try to get her over the hump. With unwavering support they come with an idea to help her ghost write her next book which is due in a few months. 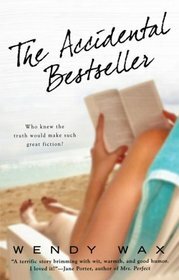 Coming up with a story of four writers with an enduring friendship (based on their own) each woman puts more of their own personal lives into the story than they care to admit is true, especially when each has secrets they have told and unexpectedly the book hits the Best Seller List. I had mixed feelings about this book. The good stuff was the story of friendship and support. The insider's look into the world of publishing and novel writing was really, really interesting. Kendall's reaction to her life falling apart by fixing things in her house was a relatable and at times humorous read. The secrets they all carried that none knew about the other made for interesting thoughts on how close their friendship really could have been if they could hide those from each other for 10 years. The mean, evil characters were exactly that. There were some things I didn't like about the story. One, as with any story, I have definite lines that I don't like to cross when it comes to reading love making scenes. This story crossed it a few times for me, which meant skipped paragraphs. That is my choice. And along with that, a story line in the book also really left me feeling uncomfortable. Without giving anything away, I will say the resolution of Faye, the televangelist's wife, secret was what bothered me. While I could see the secret and situation could happen, and the justification and reasoning has been used before, it left me with an unease of how it was wrapped up and of it's believeableness that it would so easily be brushed aside and accepted and promoted as continuing on from a religious leader's wife. There were comments made by the character, that while it sounds like it would make sense, if one knows the bible in any way, then the comments would immediately be recognized as false and not what God would be behind. In fact I thought the character was quite bold in making her claims with no biblical backing for them. It smacked to me of no biblical research being done on the subject therefore making the credibility of Faye's story line wrap up not ring true. It made for an unsatisfying finish to the book for me. I also found it a bit unbelievable that the characters would use names so similar to their own for their fictional characters in the book and then reveal their most deepest secrets about their lives. It seems that at least one of the four of them would have thought through some possible consequences. Review: Sarah is a young 10 year old girl living in occupied France during July 1942. Raised in a loving Jewish family, Sarah is growing frustrated with the frantic, whispered conversations between her mom and dad feeling she is being left out. When the French police knock on their door in the middle of the night, Sarah hides and locks her 4 year old brother into a secret cupboard to keep him safe telling him she'll be back for him in a little while when they are released. But Sarah and her family's life is about to change forever. Meanwhile 60 years later Julia Jarmond, who is an American journalist married to a French man and living in Paris, is assigned to write an article because of an upcoming commemoration of the Vel' d'Hiv', a round up of almost 10,000 Jewish people, over 4000 of which were children. But in researching for her article Julia comes across connections between her husband's family and that of Sarah's family and changes their own lives forever as she unearths secrets deeply buried. I was not prepared for the moving and gut wrenching story that this would be. It is told from both Sarah and Julia's perspectives, alternating between chapters. Sarah's voice totally gripped me and had my stomach in a ball the whole time I was reading it. Her story while fictitious is based on the historical fact of the round up and arresting of the Jewish peoples around Paris in July 1942. What is doubly horrific is that it was done, not by the Nazis, but by the French police under orders from their government who worked with the Nazis. The containment of them in a major indoor sports arena for more than a week with no food, water or bathrooms was sickening to read as was the separating of mothers and children. All were sent to Auschwitz to their deaths. And the realization that this part of the war was so kept silent and only recently talked about is heartbreaking. Julia's part of the story although not as gripping was interesting in the fact that the history and personal connection of this event changed her own life sixty years later. Very interesting to me was how the author delved into the different reactions to the event and the personal connection to them of different family members and the French people as a whole. I did feel, however, like the last 25 pages of the story (the New York setting) or so seemed to drag on. Once the climax of the story had been reached it seemed the story just wasn't wrapping up, almost like the author just couldn't let go of the characters. Sarah's story had ended but a lot of Julia's story somehow seemed to not want to finish. But in spite of that, it was a story that I am so glad the author told and well worth the read. It definitely made me think and will make me remember that date and what happened. Review: Joe Daley married his high school sweetheart and thought that was the beginning of his dreams. But when he gets turned down to fly for the army in the war due to a medical condition, Joe's life takes a very different turn. Now everything is viewed by him as life before the medical or life after the medical. As one thing after another happens that, in his eyes, makes him a disappointment, he turns to alcohol to help him get through. And then one morning, while he's flying his crop dusting plane, he hits what he figures is a very large bird. As his plane is spiraling to earth he begs God for a second chance to make things right with his family. Joe's wife Meg is heart sick as she watches her beloved Joe's life going downhill fast. For years she has tried to hide his drinking from the children but after the last broken promise she feels she cannot take it anymore. Meanwhile a former school mate has turned back up in their small farming community and is offering the town and farmers a second chance if they would sell their farms to his company. It sounds too good to pass up but are they putting their hopes in the wrong thing? I really enjoyed this book. Though when writing what it is about I found it quite difficult. There are several story lines woven throughout each other in the book that it was hard to put it down without writing way too much. But suffice it to say it is a story of second chances. There is a small spiritual element to the story that made it an interesting story. All in all it was a good read. 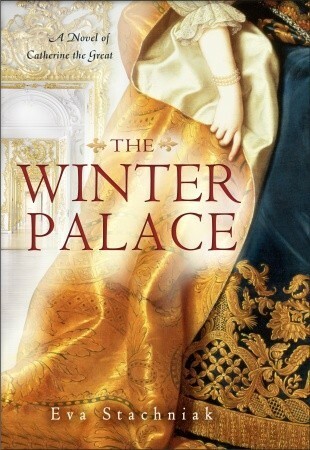 Review: The Grand Duchess Elisavyeta has always led a life of royalty. She was born a princess of Germany and married the Grand Duke Sergei of Russia and because her sister married into the Romanov dynasty and is now the Tsaritsa of all Russia, Elisavyeta lives in the very rich and pampered courts of the royals of Russia. Her husband lavishes the finest of jewels on her and she is renowned among the privileged for the these and her beauty. But the teachings and example of her mother in caring for the people never leave her and as her husband gets harder and tougher in his ruling of Moscow, she finds herself struggling with the hard lives of the people. When her husband is assassinated she sells all her jewels and possessions and builds a convent and hospital to help the poorest of the poor. She devotes her life to serving the Lord and the people. Pavel is a young, newly married peasant come to Moscow to try to provide for his wife and soon to be child. Living in squalor, sharing a basement corner with four other families he can barely afford to put bread on the table. But he and his wife have the love for their Tsar and Tsaritsa that most Russians did and with optimism believe they will be heard if they just bring their petition and trials to the attention of the Tsar. He is the "father" of the country after all, and they his "children". How can he not listen to them and help them? But when they join a peaceful march and things turn ugly, Pavel's life is changed forever and as his heart fills with hatred and bitterness he joins the revolutionaries. As Russia is thrown into turmoil Pavel's and Elisavyeta's life will be thrown together. I really liked this story. As with "The Kitchen Boy", Robert Alexander has done a lot of research into Russian history so all the historical aspects of the Romanov family and the revolution and the events leading to it are woven so well with the fictional parts of his story. The story is told in first person from two viewpoints that of Ella ( the real life Duchess turned nun) and Pavel (the fictional character, the revolutionary). Their lives take very different directions, Ella's compassionate and caring, and Pavel's, brutal and obsessed. I found it so interesting how each character dealt with the death and tragedy in their lives and chose very different paths in reaction to it. The hope that Ella brings to the sickest, the downtrodden and outcasts of Russia is in strong contrast to the hate and violence of the revolutionaries. Through the voice of Pavel, you gain an understanding of where Russia was at the time from viewpoint of the peasant and the poor and how bitterness creeping in can find hatred and will use any means to get change. I found the change in Ella's life from extravagance and oppulence to chosen poverty and service was amazing and the fact that it is true even more miraculous. In warning there is a few vulgar parts in the story. When the revolutionaries speak of the Tsaritsa, it is in very vulgar and profane terms. It is part of history, and how the revolutionaries spread hate for her amongst the people. These parts are a few paragraphs and the book is not permeated with them but they are a nasty part. Parts of the story are very violent as they deal with the real events in history of the revolution. Review: The story takes on two generations and two churches in a small town. It revolves mainly around Grandma Geri Sanders and her family and the family of fellow neighbor and pastor of one of the churches, Pastor Jim. The families are gathering in Hope Springs to attend the funeral of Pastor Jim who died suddenly. While there Grandma Geri faces a devasting health crisis and the lives of her loved ones are changed as they rally around to help her. This book, for me, took on way too many characters and way too many storylines. I lost the thread of the story several times as my mind tried to sort out who was who and which family they belonged with and which church they attended. While I had read the author's other two books I was still thrown for a loop as characters from those showed up in this book as well with no reminder backgrouds. I had to pause to remember what their personalities and stories were from the other books. While I thought she dealt with the issue of race and attitudes and relations between a white church and a black church in a gracious way the significance of that line of the story was a little drowned out for me by all the characters I had to keep track of. There is a family tree in the beginning of the book but I'm not one to constantly have to refer to it. I did like the themes of faith, forgiveness, doing what is right, unity and servanthood that are woven throughout the storylines. Review: Hannah Ryan has the perfect life. Having married her childhood sweetheart, they now share a deep love and 2 beautiful girls, 15 and 13. Tom Ryan is a doctor and very involved husband and father. Their Christian faith has been intentionally passed onto their daughters all their lives. Each year Tom takes the girls camping as a last hurrah of summer right before school is about to start. This year Hannah didn't go with them. As she waits at home, their arrival time has come and gone, and she tries to take control over her thoughts over why they might be so late without a phone call. When the news comes that her oldest daughter and husband have been killed by a drunk driver, Hannah must try to pick up the pieces of her and surviving daughter's life. But she finds herself consumed with hate for the man who destroyed her family and she throws herself into work with MADD and with helping a lawyer bring a conviction of first degree murder against the man. Hoping for the peace that she has convinced herself will come with the conviction, her daughter's and her own grieving and suffering are pushed to the side to be dealt with later and her faith is thrown out in her anger. But it isn't until her husband's dying words find their way to her that she finally finds the peace she is searching for. Karen Kingsbury has definitely dragged my emotions all over the board with this story. It is a story of love, anger, revenge, pain, loss, grieving, and forgiveness. In casting the main character as a Christian and putting her into the midst of horrible tragedy, a tragedy that could have been prevented, she is faced with what she really believes. Any one of us could face any number of tragedies that may be caused by another's carelessness or neglect here on earth and none of us knows how we would deal with such a thing unless we really go through. Do we choose to believe God even when it makes no sense to our minds? Or do we choose to hang on with everything we've got and believe He is good and in control. It's nice to think & say that we would react the way the Word tells us to with instant forgiveness and love. 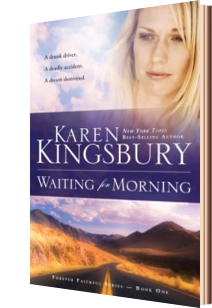 But Kingsbury gives us a character who is very real and relateable in her journey through a devastating time. At times I totally related to her and other times I wanted to shake her. Hannah's story is one that shows how choices we make and warning signals we ignore can have long term consequences on ourselves and those we love. It also shows how God's mercy and grace can reach even through the deepest of pain and help us to do what He calls us to do. I could not put this book down once I started it. Review: Jade and Tanner are childhood friends and Tanner always believed he and Jade would be married someday. But when Jade's family unexpectedly moves away it seems that dream is not to be. But Tanner has never forgotten Jade, even as he is in school pursuing the dreams his Mother has for him of a political nature. When their paths cross again while Tanner is doing a practicum for school, they fall back into their friendship of years past much to the shock and horror of his mother. Soon it becomes more and once again Tanner is determined to marry her. But first he wants to go on an extended mission trip to Hungary to see for himself what religious oppression does to people. But before he leaves they get themselves into a situation and Jade finds herself pregnant. There is no way to reach Tanner while he is on the mission and so Jade turns to his mother for advice. What she tells Jade changes the course of their lives. Jade goes on to marry a young man from high school and Tanner returns from the mission trip to find this out and spends the next 10 years confused and grieving the loss of Jade even as he pursues becoming a legal religious freedom fighter in America. But their paths cross again when Jade finds herself in the kind of trouble that only Tanner and his law firm can get her out of. I found that while the story was really good, this installment in the series didn't grab me quite as much as the first book. But that is my head space as I've always had a place in my heart for the MADD organization and those families who lose loved ones to drunk drivers. This book was no less thought provoking or important in it's content, however, as it examined the eroding religious freedoms of some individuals in America. It also continues with themes of redemption and forgiveness that were part of the first book. Matt and Hannah are reintroduced into this story as Matt becomes Tanner's partner in the law firm fighting religious freedom but their story is really kept to a minimum as it is really focused on Jade and Tanner and what is happening to them. Review: In the last installment to the series, Jade and Tanner have now married but Jade still feels insecurities of whether they had done the right thing. Matt and Hannah have finally decided to adopt and both families are now very close friends. Just as their lives seem to be really going along with a little girl coming to Matt and Hannah and Jade finally after years of trying has become pregnant. But things take a huge downturn for both families and they must draw on every bit of faith they have to make it through. This last book of the series delves into what we believe about God's forgiveness and God's plan and goodness in our lives. It explores marriage, friendship and faith in the most trying of circumstances. This was a story that was just as good as the first two though I did find the author made a lot of background info and references to what happened in the first two books all throughout this story. Which was okay if you didn't read the first two installments but because I did read them I found myself scanning a lot of pages because to me it was redundant. I know a lot of people find the happy outcomes to this author's books frustrating but I find sometimes one just needs that. I like the positive outcomes to battles fought in faith. It lifts my own faith as I find the not so perfect characters making mistakes and struggling through their own trials coming to good resolutions so I find this series was well worth the read. Review: In 1856, Nannie and her beloved sister and brother in law, Jessie and her two brothers, Anne and her family, and Louisa and her family, join others from England and make the trip to the U.S as Mormon converts headed to the Zion. Louisa is married to a church leader and missionary who did much of the preaching in England and while many find her husband overbearing she believes he speaks for God. Nannie, from Scotland, was abandoned on her wedding day and is horrified to find that her former fiance is travelling in the same Company with his new wife. Jessie and her brothers have dreams of farming in Zion, dreams that made selling everything they had seem worth the risk. Anne has not yet converted to Mormonism, but feels forced to come along as her husband sold everything including their very successful tailoring business and she has nothing left. Fearing he'd take the children without her, she joins him on the trek. Being promised by Brigham Young that they would have wagons and guides, they get to Iowa City only to find that they have no wagons and must instead build two-wheeled handcarts that they will push and pull. Being forced to downsize their already meager belongs, they set off on a 1300 mile journey on foot. Their company, the Martin Handcart Company, is the last to leave. With great hope of joining other companies already successfully arrived in Salt Lake City, they have no idea of the hardships and devastation that await them. Or of the strong bond of friendship that this hardship will cement between them. Based on the true story of the actual trip of the handcart company, this story was typical of the author's amazing story telling ability. The rich characters she painted and the all too human weaknesses made this a moving story from beginning to end. On her website she states she is not Mormon but wanted to tell the story of what the women went through and how the bonds of friendship helped to see them through struggle, bone weariness, overwhelming heat and cold, starvation and death. My heart was gripped through the whole story at what they were going through and every emotion was pulled out of me. It's hard to believe that the foundation of this story is true and decisions made on the behalf of hundreds of trusting people put their lives and their family's lives on the the line. Though it is a story of Mormon history the author makes just enough references to aspects of their religion to bring knowledge of what was going on at the time and decisions made and reasoning for them and not as a story meant to convince you to convert. 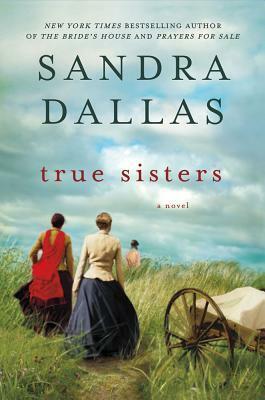 It's a heart moving and heart wrenching story built around the character's of these four women and their families. At the very end, the author tells what eventually happened in the lives of these women after they reached Salt Lake City, but I'm still trying to decided if it was just a wrap up to the fictional characters or if these women were really historical figures. Review: Holly Oak is a huge old Southern Mansion that has seen it's share of tragedy over the years. When Marielle Bishop marries Carson he brings her to "his" home where he lives with his two children from his deceased wife and her grandmother, Adelaide, now 90 years old. But "his" home is really Adelaide's and it has been in her family for generations. Having lived through tragedy in her own life, including having a mentally ill daughter who ran away from home in her teens and was rarely heard from, Adelaide now has superstitions and strange beliefs about this home she has known all her life. As Marielle trys to start her new life, what she at first believes to be the odd musings of an old woman start to become a bit muddled and she starts to wonder if the house really does bring misfortune to the female occupants. As she tries to sort it all out, she comes across some old diaries of Carson's deceased first wife and it leads her on a quest to find out the truth about the house and it's occupants. I usually love Susan Meissner stories. Her stories always draw me in through the character's lives and I love how she blends history within the contemporary story. This book, however, didn't grab me in quite the same way or felt as enjoyable as her former books. The contemporary part of the story was interesting, for awhile, but then it started to get too mish mashed for me with all the different characters and their separate views of what went on with the house, most of which were superstitions and just odd. Then when the historical part of the story started the tale was told through letters that were written by a young Susannah, Adelaide's great grandmother. Susannah was rumored to have been a traitor in the civil war and all the fears of Holly Oak being haunted are rooted in her story but hers was really a story of sacrifice. A full 1/4 of the book were page after page of these letters and I just couldn't get into that style of storytelling. 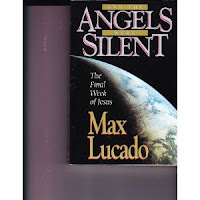 Though this book is marketed to a Christian reader it really did not have a whole lot in it to do with God. Only one character is even mentioned as a believer and that was just barely touched upon. The story also contained a person who is supposedly spiritually sensitive and senses a presence in the house which everyone thinks is the ghost of Susannah. The character is probably what I would label a medium and I definitely wasn't enjoying the parts of the book where her viewpoint and practices were being the focus. to me there was never any real resolution in speaking to this and the other superstitions presented as against scripture and the Christian viewpoint represented and therefore I wonder why this book was marketed as Christian. I'll read other Susan Meissner books because the other three or four I have read were really, really good but as far as this one is concerned I was disappointed. Review: Lily is a 14 year old girl living on a peach farm in South Carolina in 1964. Her mother died when she was 4 and Lily believes it is her fault. Her father shows her no love and deals with her harshly and the only person she can turn to is her African American nanny, Rosaleen. But when Rosaleen is arrested when provoked by the town's worst rascist, Lily feels totally alone. In a rash decision to run away and break Rosaleen out of the town jail, the two embark on a journey towards a town called Tiburon. Lily found the name of a town on a picture of a black Madonna that was part of her mother's few possessions. So in an effort to connect with her deceased Mom, the two set out on a journey that leads them to the home of 3 bee keeping sisters. The sisters take them in, with hardly a question asked and it's here that Lily finds answers to those questions that she has struggled with for so long. It's a story that involves turbulent racial times, racism, love and finding your place and where home is. I finally got around to reading this book. But it took over 2 weeks to get through it. It just didn't grab me. "Plodding along" is how I felt reading through it. I kept reading it because it is a book that has had so much "buzz" (haha) about it. That's what compelled me to keep reading, not so much the story. I have to admit the whole aspect of the story that revolved around the black Madonna did not appeal to me at all, and it ended up being a huge part of the story. I thought the rituals with the madonna were just plain weird and the divine personality and abilities attributed to the Madonna was just maddening from a Christian perspective. Some parts of the story I thought were either a bit unbelievable or not followed through enough. Case in point was the part where Lily, the young white girl, and Zach, a teenage black teen who worked at the bee farm, had gone to town and get mixed up in a racial argument that ends up with a white man with a broken nose and several black teens, including Zach, being hauled off to jail. Serious stuff. That Lily just sits in the truck throughout, with seemingly not a lot of fear, with not one person noticing that she was actually with one of the black teens and she wasn't questioned or even acknowledged and just walked away is strange to me. This was set in the South in racially turbulent, scary times. What I did like though, was the story of the closeness of the 3 sisters. I really liked some of the personalities of the main characters. I did like how the author described things in the book like the pink house, the honey house and bees and their lives. But the story just didn't have that "can't put it down, stay up way too late reading" feel to it for me. I just don't get the fascination of this story that seems to be out there. Updated to add: I watched the movie on the weekend and I must say that in this rare case I liked the movie better than the book. The movie did not focus on the black madonna at all, revealing only what was needed. And it really brought out the emotions of Lily and the beekeeper sisters in a really nice way. Review: This is essentially the story of two families. One a family that has been disconnected through divorce and now faces a crisis and the other a family trying to find their way through a tragedy and grief that has paralyzed them. The common denominator that ties the two together is Grace Oliver. Grace has felt disconnected from her father and brothers ever since her mother moved her away to Portland in the aftermath of divorce when she was six. With only occasional visits to her father, she has always felt on the outside edges of the Oliver side of the family. When her brother calls to say that her dad has had an accident and has a broken leg, Grace puts her life on hold and returns home for a few weeks to help her father recover. When home the family is hit with the shock of finding that their father also is in the early stages of Alzheimer's and Grace extends her stay indefinitely. Next door to her father is a young family who has lost their mother and one daughter to a car accident the year before. The father in deep grief, cannot seem to be able to surface out of it in order to help his other children, one of whom feels responsible for the accident. As the family dynamics spiral downward the younger children (aged 10 & 15) find a friend in Grace and Mr. Oliver even as the older teen resents Grace for perceived intrusions into their life. This was my first read by this author and I have to say I did enjoy it. It has lots of heart rending moments as each family deals with loss. The parts that really tore my heart were the ones that involved the kids and how they were dealing with the loss of mom and sister and now, basically, an absentee father. The author wove in heartwarming moments and light heartedness so what could have been a very heavy story was lifted by these parts of the story. There were however, a few cheesier moments in the story that did nothing to elevate it for me and the end did wrap up "all of a sudden" for me but for the most part it was a good story that involved me emotionally on many levels with the characters. Review: After Maggie wakes up from being in a coma for 4 months, Dylan is elated but knows he and Maggie must walk through the grief of losing their son during the birth that put Maggie into the coma. Dylan finds it hard to talk about the things he went through when Maggie was in the coma so she asks him to write it down instead of talking. But Dylan feels he can't share the deep, heart breaking things where he came to the end of himself with Maggie, feeling she is on the edge of emotional breakdown herself. So he writes two stories, one that only shares some of the things which he gives to Maggie, and one that tells the gut wrenching truth, the one he hides in the floor boards. As they try to put their lives back together and deal with their grief, Maggie once again finds herself pregnant. Though it brings joy, it also brings fear. Fear that the unspeakable could happen once again. "I've never been a fearful man. That does not mean I've never known fear; God knows I have. There's no S pinned on my chest. I just mean it's not something that stays with me all day perched atop my shoulder and whispering in my ear. In the months after Maggie woke up, I wrestled - even battled- with a long litany of what ifs that scared me . But her waking every morning had put that whisper to rest. But the moment I leaned in and listened, tasting the trickle of hope and wondering at the unfathomable enormity once again, the whisper echoed. It smelled like the air behind the trash truck, the soil in Pinky's stall, or the floor of the delivery room. It's breath alone could gag a maggot. Whereas hope had returned only after I'd cornered him in the barn and extended an invitation, what if reached up out of the floorboards, threw his bags on the couch, and made himself at home without so much as a peep. And unlike hope, who was tidy and neat, what if was a slob, seldom cleaning up after himself, and made it his point to throw remnants of his life in every nook and cranny of the house. Polar opposites, hope never raised his voice, while what if never lowered his. Not compatible roommates, they charged the air with a tension that even Blue (the dog) picked up on." Published by Thomas Nelson, Inc. Loved this story of redemption, hope, love and commitment. Review: Tyler Steele is a third generation Texas Ranger. Honest, kind and with a strong sense of wrong and right and protecting the innocent, his dedication comes with lots of glory and with lots of sacrifice including his marriage falling apart. Now he is retired and raising his 11 year old son on his own trying to find his way. Heading home one night he literally runs into a woman and her daughter who need help. In trying to help them he finds out that they are on the run from an abusive ex who has abused both mother and daughter and who can access ways to hunt them down. In protective mode he takes them to his town and gives them a place to stay hoping to keep them safe. But things start getting out of control when his feelings turn to more than general protection and when the ex finds them and the local prison breaks out in riot. So far I have loved the books by this author that I have read. He was quickly climbing my ladder to become one of my favorites. But this novel didn't capture me the same way. The story started as a great premise but I found it was so drawn out. While in his other stories that I've read, the author's use of words captivated me, I found this story to be very wordy and I found myself starting to skim over huge parts where the conversation just didn't stop. While I loved the morality and strong character of Tyler, the characters of Sam and Andie had me hanging in how I felt about them. As the story built and the attraction between Tyler and Sam started to build, there were parts that I was just getting plain uncomfortable with. I found her throwing herself at him cringeworthy a lot of the time and of course, because the character of Tyler is narrating the story you get his descriptions of his attraction to her. Though he is ever the gentleman and has high moral standards, you are privy to his thoughts on the matter. Parts of the story are narrated by ten year old Hope who was abused It's in the form of journal writing and letters to God. These are the most emotional parts of the story for me as she trys to sort out what has happened to her and why and her thoughts and observations of the man that is helping them. Though some of these entries I found inconsistent in that one time it was like a hurt desperate little girl talking and other times I could not accept them as a 10 year old writing them. The thoughts and wording were just too mature. So though it bugs me to say it, and though he still is one of my favorite authors, this novel is not one I'm raving about. Review: Jonathan Cobb is an English professor who takes a sabbatical from teaching to take a kayaking trip down the Allagash River in Maine so that he can experience what Thoreau experienced, that of simple living and enjoying nature. Little does he know it will change his life forever but not in the way he supposes. On his first day there he meets Mary, a corvid (crow and raven) scientist, who also loves the simple life and deriving pleasure from nature. From the moment they meet they fall madly and deeply in love. But Mary, and now Cobb with her, must face some hard turbulents in her life, harder than the river rapids they are kayaking together. As they try to build the best life they can together, Mary's outlook on life, to live each day to the absolute fullest, brings them closer and more in love as they face the hard times. This was a lovely story, one of deep love and absolute commitment no matter life's journey. It was a story of friendship and uplifting others. And it was a story of living life the best you know how, to the fullest living in each moment. The settings in the book of Maine, Indonesia and Yellowstone National Park were beautifully described by the author. It made me want to go to all three areas just to experience them. The story incorporated a lot of nature into it and I think I learned more about crows than I ever thought I wanted to know. LOL. While I did enjoy the interjections of nature throughout, I did sort of tire of some of the mythology & storytelling within the story, a story within a story, per se. But that is personally me. I'm sure there was some significance to those but I was too caught up in the other aspects of the story to focus on figuring all that out. I found myself skipping a few of those. But the main story itself, that of Mary and Cobb's life together was told beautifully and I liked how the author mingled that together with a group that reaches out to young girls and whose influence had greatly affected Mary's life . I also liked how he used the river as a significant part of the story affecting both Cobb and Mary's lives from beginning to end. A box of kleenex is definitely a must in the last chapters. The book does delve into a very tough subject that is a hot debate right now. I don't want to reveal it though because it will give away some aspects. It did make me think about it though, not to agree or disagree with it, but to think about it, to where exactly my stand might be. Review: When this book came up for review, I requested it right away. It went right along with something we'd been talking about at bible study: giving every bit of ourselves, not just pieces of ourselves or certain areas to the Lord. Mary DeMuth speaks from her heart and shares stories that have brought her to places of facing the challenge of surrendering all to the Lord and in Him finding the everything that we want and need. The book is broken down into three areas of surrender: our Head - What We Think, our Heart-Who We Are, and our Hands-How We Live. These areas include chapters that delve more into the specific areas that everyone finds harder to relinquish such as worry, failure, insecurity, control, letting the past define us, letting others define us, the vows that we make are just a few example. I found this book to be a great encouragement in showing how Jesus desires to be all that we need and that it is a good thing to give up even those areas that we hide deep inside that no one can see. We've all got them. All of us find some areas easier than others. As I read and answered the questions at the end of each chapter, I felt challenged yet could feel that desire to let it all go and get closer to God and find in Jesus all that I'm really searching for. I will be honest in saying that, for me, this is not a book that can just be sat down and read. While the style is pleasant reading for a non-fiction, it is challenging in the sense of causing me to look deep inside. I had to take breaks and chew on what the author was trying to get across. Sometimes I had to reread sections and paragraphs. But it was sorta like a friend cheering me on to do the very thing that would get me closer to the Lord. Uncompleted: Set aside at page 59. Couldn't get into it at all. The style of writing didn't draw me in the least. Review: Lucy Jarret lives in Japan with her boyfriend Yoshi. Having recently lost her job, Lucy feels unsettled in all aspects of her life, including her relationship with Yoshi. When news comes that her mother has been in an accident and has hurt her arm, upon Yoshi's suggestion Lucy decides to return to the States to lend a hand until her mother can heal. But returning to Lake of Dreams has stirred up all the reasons why Lucy left. 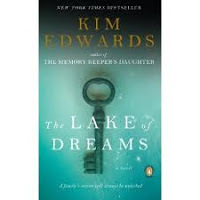 The drowning death of her father ten years before still haunts her and she is thrown for a loop when she returns to find her mother dating another man and that her old love now has a glass business in town. Restless and not knowing where she belongs she comes across some papers in her family's home from the early 1900's as well as a few handwritten notes written by a person named Rose. Her attention is captured and she sets out to find out who this Rose was and how she was connected to her family. What she unearths changes her and her family's lives. I really enjoyed the major parts of this story though did find it a tad slow going in the beginning. But once the mystery started building it was hard to put down. The author's attention to detail about the historical aspects of the suffrage movement of the early century was really interesting and I liked how it was woven into the the contemporary part of the story through the family connection. The dilemmas that women faced and hard choices they had to make because of the views of the times were told through the life story of Rose as Lucy discovered it. I enjoyed reading of Lucy's journey to discovering herself through her almost obsession of finding what happened to Rose. There were a few aspects of the story that were frustrating to me and those were the parts I didn't enjoy. The whole part of the comet I could have done without, to me it was just another detail that I had to remember and when it came up later in the story I found myself thinking "oh yeah, that was in here". Lucy's selfishness was sometimes annoying and her reactions were sometimes those of a teenager and not a 30 year old who'd lived around the world but as you read on she seems stuck at the point her father drowned and is not able to move emotionally from there. A very frustrating part of the story for me occured when a secret was revealed accidentally and the mother in her excitement insisted on disclosing that she knew, no matter the consequence or the fallout or the feelings involved. I found that quite unrealistic, at least compared with mothers that I know. I did close the book feeling satisfied with the ending and that the story was complete (not always the feeling I get with some novels). 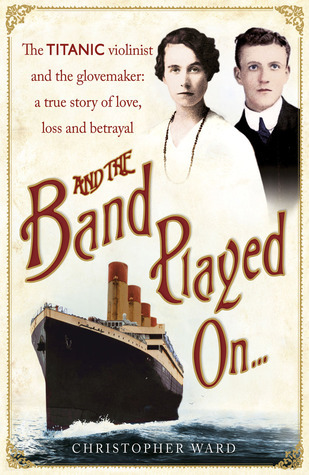 Review: This is the story of Jock Hume, one of the band members on board the Titanic, who played music to keep passengers calm while the ship went down. Written by his grandson, it is family history that has been both passed down and researched by the author. It's a fascinating look into what happened after the Titanic sank and how it personally affected this one family. There is lots of interesting facts and details, many of which I'd I'd never heard before, incorporated into the story about the Titanic and what happened, but there is also the very personal elements of this family's loss that impacted them deeply and that they carried with themselves long after the sinking. At times it was hard to read of the family dynamics but ultimately it was the story of a real person who died giving of his talents to others. It was hard to put the down. Review: It is the late 1960's and Lynnie, known as "No-no", and Homan, known only as No. Forty Two as they don't know his name, escape the School for Incurable and Feebleminded in Pennsylvania. Both Lynnie and Homan have been committed to the school, left and forgotten by everyone they've known. Lynnie, by her parents, because she had a developmental disability and Homan, by the police because he is deaf and unable to communicate and they didn't know who he was. Being higher functioning, they are allowed a little bit more freedom within the institution and so manage to meet secretly now and then forming an deep bond and friendship which eventually leads to love. On the night they escape, they knock on the farmhouse door of a widow and former teacher named Martha, who despite her fear takes a bold step of compassion and lets them in, feeding and clothing them. But they also bring with them a newborn infant, one that no one knows about, and when the police knock on the door looking for them, Martha makes a promise and pledge to Lynnie to hide the child. While Homan escapes once again, Lynnie is taken back to the institution with the hopes that Homan will come back for her and they will find Martha and the baby. But Homan's life takes on twists and turns that he never could have forseen and as he tries to navigate the world without hearing and understanding he is taken away farther and farther away from where Lynnie is, not knowing how to get back to her. Lynnie lives her days in the horrors of the institution while finding a friend in a worker there who takes her under her wing. Martha makes good on her promise to hide the baby and take of her and spends many years on the run moving from city to city. That timid knock on the farmhouse door will change all their lives and the next forty years will see them face insurmountable odds while trying to keep their hopes alive that one day they will reunite. I picked this book up because the description on the back grabbed me. My field of study and interests in college was Rehabilitation Services and there was a couple of institutions that we were supposed to tour during our study years. I was always very interested in the courses that studied the history and attitudes of the different time periods of society and how they treated their handicapped, who they considered were disabled and what they did to and for the individuals. This was an incredible story that showed the plight of hundreds of thousands of American people in the 60's and 70's who were committed to institutions around the country not only for severe handicaps for such small things as not pronouncing their words properly or for being deaf or blind. Because the story spanned so many years it also took us through the movement to deinstitutionalize those that had been "put away" and forgotten and bring them back into the community. Through much research and the inspiration of a true story she read of an African American deaf man who was committed simply because he could not communicate and make himself understood and having the experience of a sister with developmental disabilities whom her parents refused to send to an institution, the author shows us not only the horror of what the institutions were like but also the opposite side, the story of those support workers who were caring and loving individuals and did the best they could for the patients in the most awful of circumstances. The story was an emotional ride that spanned forty years of three individuals who were drawn together by circumstance, love and commitment and though at times lost hope, continued to press on in their search to reunite. It was beautiful and heart wrenching and definitely needed keenex at the end. The author's notes and Q and A with the author at the back of the book were well worth the read and added greatly to the story. One of my favorite reads for 2012! One of my favorite books, as well. Charles Martin is always on my 'must read' list. Try "The Dead Don't Dance" and its sequel. Awesome. 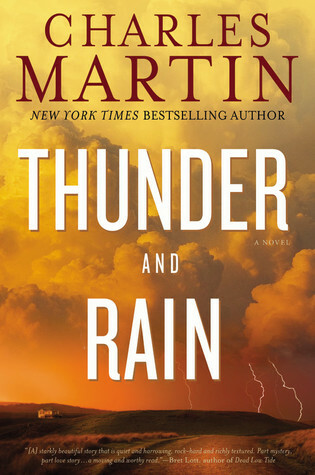 Thanks for the review on this book, Wrapped in Rain. Forgiveness is something God has been leading me to again and again. probably because it is a topic most people (me included) need to deal with in their lives. I will be checking out this book and the other two that Karyn suggested. I read one of his books a few years ago -- When Crickets Cry. I remember being captivated and thinking the writing was just gorgeous. But one really odd thing was that the main spiritual character in the book was a barkeeper with the philosophy something like you have to give people a little of what they're craving for (alcohol, etc.) so they'll listen when you try to talk to them about the Lord. I may not be remembering it right, but it was something like that. And I just couldn't decide what to make of that so I ended up not ever reviewing it. Your review here is making me want to give him another try.